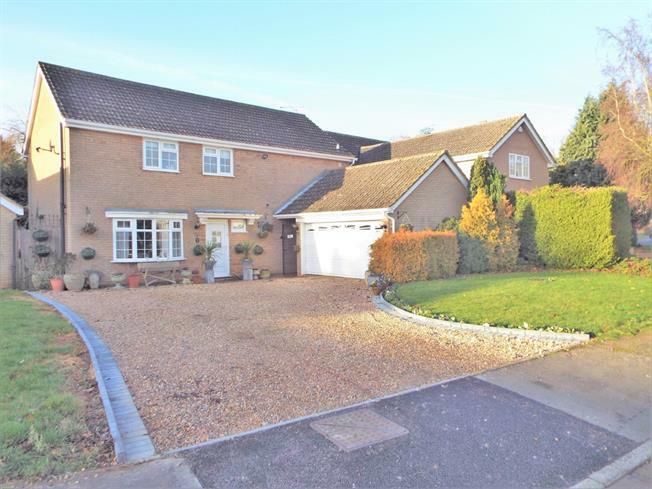 4 Bedroom Detached House For Sale in Oakham for Offers Over £450,000. Occupying a desirable cul de sac location, in a desirable Rutland village is this impressive four bedroom detached house. The property is very well presented throughout and offers generous living space on two levels with the potential to further increase the living space and adding further bedrooms and bathrooms, in line with neighbouring properties (subject to planning permission being obtained). The property benefits from entrance porch, entrance hall with under stairs WC, lounge with double doors to rear garden and a gas feature fire, dining room that leads into a modern kitchen with utility room. The first floor presents three double bedrooms all with fitted wardrobes, a well appointed family bathroom with shower over bath, a single bedroom and a recently upgraded shower en suite off the largest double bedroom. Other features include gas central heating, double glazed windows and doors and fitted kitchen appliances including SMEG oven/hob/extractor, larder, fridge and dishwasher. Externally the property offers a generous and private laid to lawn West facing, fully enclosed rear garden with a raised decked seating area, and a paved patio. The front offers driveway parking for a minimum of four cars and has a detached double garage. Langham is a friendly village, situated on the edge of Oakham with local amenities, schools and places of interest within easy reach.